Copenhagan [has been rendered] … a city of turmoil … and the same exciting scenes recurred in Amsterdam. Beatlemania is coming … So watch out Australia. Beatlemania was in full swing in 1964 and the spectacle was coming to Queensland. While the thought of the Fab Four visiting Brisbane was sending fans into a frenzy, it was causing headaches for the police. The first problem was going to be crowd control at Brisbane Airport, then at Eagle Farm. The Department of Civil Aviation was so concerned that three meetings were held in May 1964, with representatives of the Queensland Police, Commonwealth Police, the private security company which looked after the airport perimeter and the airlines. It saw girls who had demurely taken their seats at the opening as though attending a school concert writhing on the floor, crying, clenching their fists and … mentally in a faraway world of their own creation. At the time, the Ansett-ANA plane carrying the Beatles from Sydney was expected to arrive at 11.50am on Monday 29th June. After much discussion it was decided the plane would arrive at the VIP area, disembark the Beatles and their entourage (about 30 people in total), then proceed to the terminal. The Beatles would be driven along the fence then proceed to Festival Hall in Charlotte Street for a press conference at 1pm. The police would issue press passes to journalists and photographers. 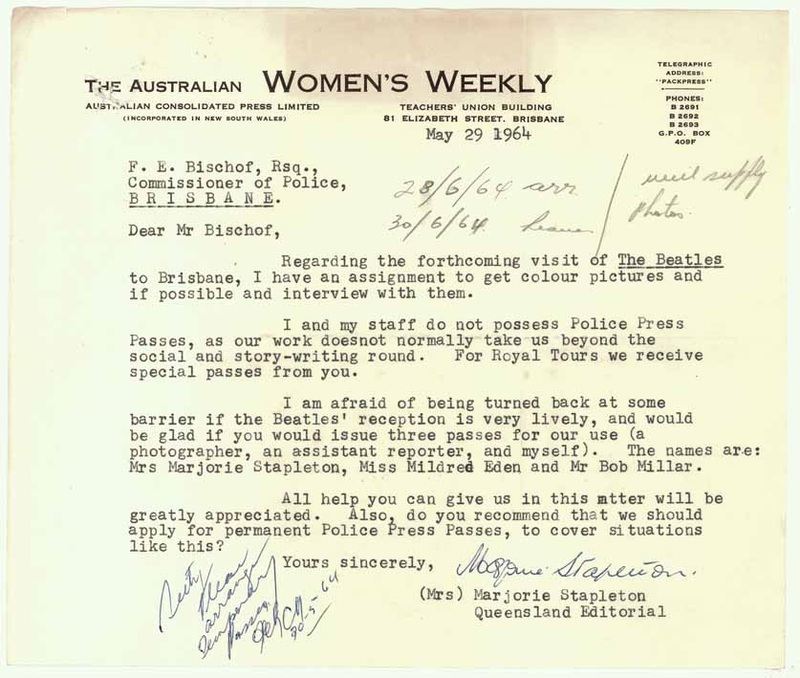 QSA Digital Image ID 2916: Letter from Marjorie Stapleton of “The Australian Women’s Weekly” to the Commissioner of Police requesting police press passes for herself, the assistant reporter and the photographer for the forthcoming visit of the Beatles to Brisbane, 29 May 1964. The VIP area was somewhat out of the way but presented security problems. Barricades would be needed to keep the estimated crowd of 30,000 people away from the workshops and clear of the access roads. Traffic control would be an issue with the public parking area expected to be full of excited Beatles fans. Extra police and private security would be needed to patrol inside and outside the fence line, terminals and other public areas. Two ambulances would be on hand, just in case. For a teenager in 1964 in Australia, the most radical thing you could conceivably do would be to stand in a public place and scream at the top of your lungs. And to do that and to push against police barricades and to refuse the instructions of the order of the day to move on was an adrenalin rush that can’t be described. Then came the first spanner in the works. Instead of using a scheduled flight, the Beatles would be on a chartered plane from Sydney and would not arrive in Brisbane until after midnight. The news was broken by the Brisbane Telegraph on 17th June before even the police knew about the change. The plans were redrawn. Police and security would start to close off and barricade parts of the airport around 4pm. Queensland Police would guard the main fences, barricades and gates to public roads and assist control of entry to the airline terminals. In total, 210 uniformed police and 24 detectives would be on duty to manage the crowd. They were drawn mainly from the Brisbane and Fortitude Valley districts, but some were brought in from Ipswich and the South Coast. The Beatles arrival in Melbourne recalls similar scenes in Hitler’s Nazi Germany twenty-five years ago and scenes in Russia when there is a rally. If anyone told me that I would be witnessing such mass hysteria by our own beautiful Australian youth to greet these musicians from overseas, I would never have believed them! What does the future hold for us all when youth can be influenced so easily? Commonwealth Police would attend the International Terminal and control the movement of people inside the perimeter. Private security would be increased around the terminal and administration buildings. An extra fire engine would be inside the fence, as fast access by road in case of an aircraft emergency was going to be difficult. The Ambulance Brigade would have six stretchers and dozens of blankets on hand. The Department of Civil Aviation would provide the tea. Crowds and media started arriving around 7pm but the later arrival was a blessing in disguise as only about 10,000 people were in the viewing area when the plane arrived. 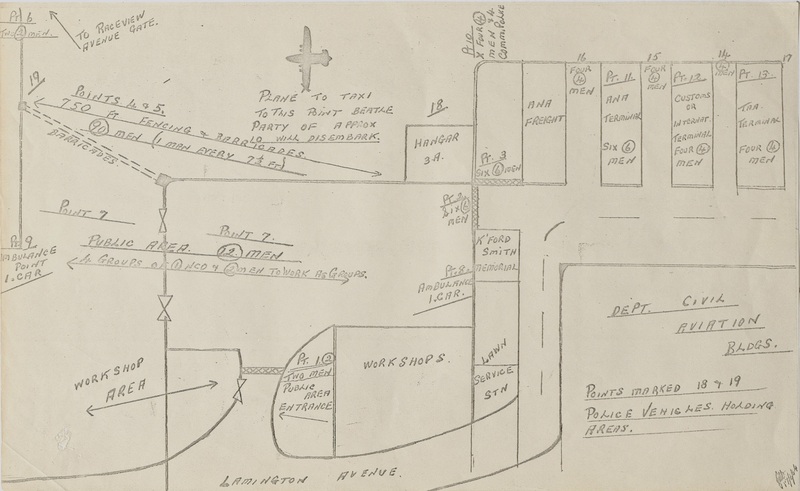 QSA Item ID 318753: Drawing of crowd control arrangements at Brisbane Airport. The next issue was crowd control during the concerts. Festival Hall held 5,600 people and there would be two concerts on each of the two nights. The Commissioner of Police, Frank Bischof, wrote to his counterparts in New South Wales, Victoria and South Australia asking for advice. Each provided very detailed reports on the arrangements they had made. After discussions with Festival Hall and Lennons Hotel, it was decided that another 202 uniformed police and detectives would be required. This included 40 outside the hotel and 35 inside Festival Hall. 12 police would be in front of the stage to prevent any attempt to rush the band. 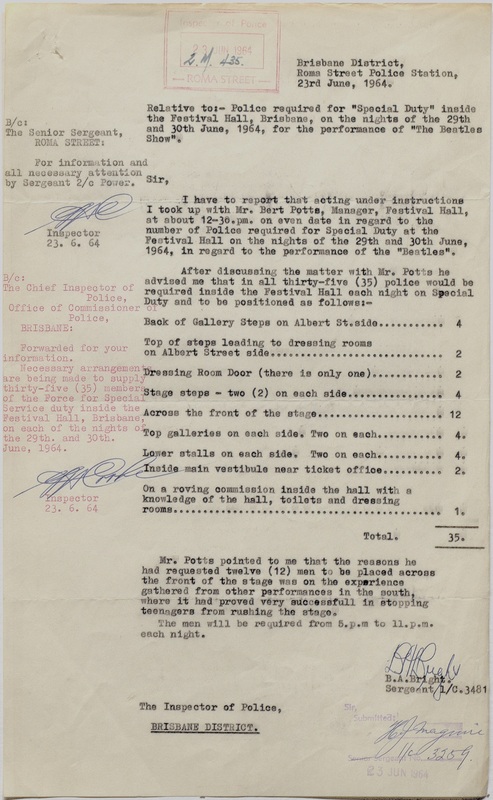 QSA Item ID 318753: Special duty arrangements for policing the Beatles concert at Festival Hall in Brisbane. The other more serious incident involved several police officers, press photographers and reporters. The Secretary of the Australian Journalists’ Association wrote to Commissioner Bischof complaining that its members had been threatened with arrest and assaulted. He wrote that “some police officers adopted the view that photographing the crowds of teenagers at the Brisbane Airport and at the Festival Hall incited them to misbehave.” The AJA sent copies of the letter to the Premier and the Minister for Police. Another 100 police were on duty at the Airport on the morning of 1st July for the departure of the Beatles at 7.40am, but there was only a small crowd of about 500 people present to see them off. It was here that people staged the greatest outpouring of adoration the Beatles or any other pop group would ever witness. Less than a month later it was over. The Beatles were gone. And again it was a vastly different Australia with a vastly different view of what the world was all about. 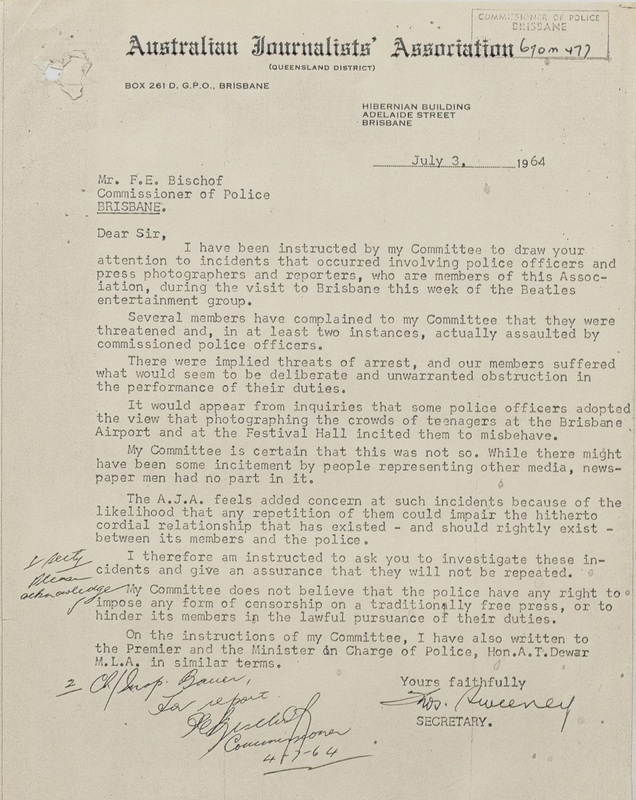 QSA Item ID 318753: Letter from the Australian Journalists’ Association complaining about the action of police when the Beatles arrived at the airport. The correspondence between the Police, the government and AJA continued until December when the AJA Queensland District “now considers the matters in dispute settled amicably” and accepted that “no deliberate attack was ever intended on Association members”. We’d love to hear more about your recollections of The Beatles visit to Brisbane in 1964 – drop us a line on Facebook or comment on this blog to get in contact with us and share your story! Having researched The Beatles Australian Tour for the past 20 years, I was delighted to read this article, and the logistics involved in providing police security for their stay in Brisbane. It will be added to my file of research. If you view the Cinesound vision of the Airport arrival you’ll see Sergeant Terry Lewis walk through frame. It was my research that caused Bob Katter to “fess-up” in 2004, and I revealed (with photographic evidence) the secret trip by Paul McCartney and George Harrison to Tambourine Mountain – during the Beatles 1964 Tour Exhibition at the Cobb+Co. Museum in Toowoomba in 2014. I’d really love to chat with the detectives who accompanied Paul and George on their excursion to the mountain and the Gold Coast on 30th June, 1964. Jeffrey Black, Guest Curator, Beatles 1964 Tour Exhibition (2014). Thanks for your comment Jeffrey, your research on The Beatles sounds fascinating!